The video opens on a birds-eye view of a city through a green tinted lens. An electronic user interface lights up the screen, an homage to the robot vision from The Terminator. The camera pulls out to reveal the surveiller—an armed Predator drone. “Someone is always watching,” reads a menacing sentence floating below the death machine. So begins a video produced by Pastor Ed Young and his Fellowship Church in Grapevine, Texas. It’s part of a teaching series Young devised to explain the unknowable mysteries of God. You read that right. Young used the most terrifying and controversial aspects of drones—their ubiquity and potential for force—as a metaphor for God. Young is a powerful speaker and his theology is pretty standard for Texas. Baptist churches all over the state speak of God in much the same way. The above advertisement ran in Dallas area movie theaters the first weekend of August. Thousands of movie fans saw the creepy ad before watching Guardians of the Galaxy. Young sermonized drones over three consecutive Sundays in the middle of August at his Grapevine megachurch. Fellowship Church recorded the sermons and simulcast them at its nine satellite locations. Most of the churches are in Texas, a few in Florida and one in far away London. Videos of all three sermons are on YouTube. 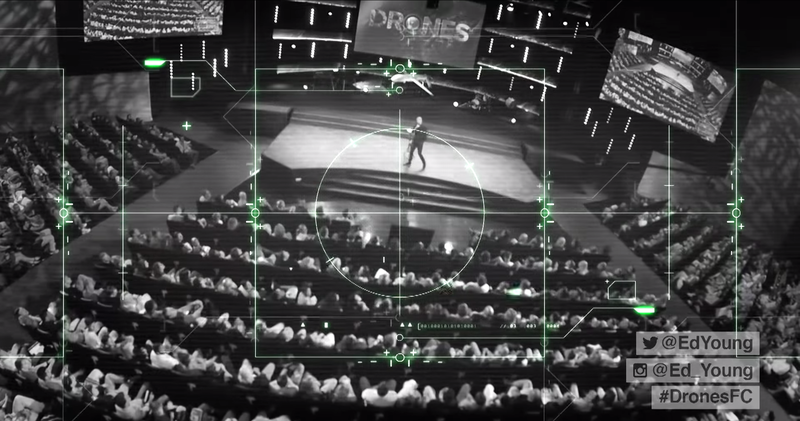 The sermons begin with a slick video of a drone flying over a city. A live band plays in the background. A huge model drone looms on stage. Smoke billows from underneath it. Young emerges—a grin on his face—to explain his thinking on killer robots. Sharkey is a robotics professor at the University of Sheffield in England and a founding member of the Campaign to Stop Killer Robots. The group travels the world and spreads information about the dangers of autonomous kill-’bots. To call drones “sort of controversial” is a grotesque understatement. Armed drones have killed more than 4,000 people in the last decade. The U.S. military alone maintains at least 300 of the lethal robots. Experts are just beginning to understand the psychological effects of drones on both the pilots who fly them and the civilians down below. Young is familiar with controversy. His drones series is just the latest in a long line of gimmick sermons aimed at luring new parishioners. Readers may remember him making headlines several years ago when he advocated a “sexperiment.” Young advised married couples to screw seven days in a row to see how it strengthened their relationship. In a further bid for attention, Young and his wife camped out in bed atop their Grapevine church for 24 hours. No one observed them in flagrante delicto. A former member of Fellowship Church explained to War is Boring that this kind of grandstanding long has been the Church’s modus operandi. According to the source, Young employed a unique strategy to fight drops in Sunday morning attendance during football season. He promised pizza and a place to watch the game to anyone who attended. It worked. Attendance picked up and donations rolled in. Young has drawn in the public with strange, gimmicky sermons ever since. It’s profitable. WFFA-TV—Dallas’ ABC affiliate—investigated Young back in 2010. Lead investigative reporter Brett Shipp uncovered a wealthy lifestyle and shady business practices. At the time, Young lived in a $1.5-million McMansion and flew around the country in an $8.4-million dollar jet. All in service of the Lord. Update 8/26/14—Ed Young contacted us after this article’s initial publication. We spoke with him on the phone. We’ve updated the article to reflect that conversation.